Riding a manual wheelchair everywhere you go can be exceptionally tiring, which is why Rio Mobility has introduced the Firefly, an electric attachment that easily clamps on to most manual wheelchairs. 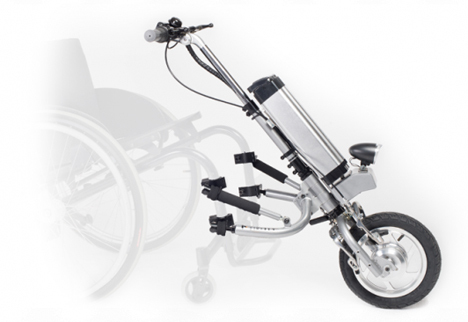 The small device attaches in less than a minute and turns the manual wheelchair into a type of power trike. 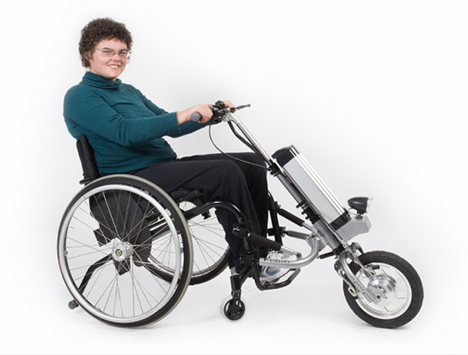 The Firefly lifts the wheelchair’s smaller front wheels off of the ground and replaces them with a larger single wheel. The wheel is attached to a power pack and a set of motorcycle-like handlebars. The device features an odometer, a speedometer, a reverse gear, a parking brake, a twist throttle and two brake levers. In other words, it’s almost like turning your chair into a cool little power chair that gives you the power to go back to your manual chair whenever you like. With a top speed of about 11 MPH and a range of 15 miles per charge, the Firefly seems just about right for running errands on those days when you’re just not feeling up to going the manual route. The contraption only weighs a little over 30 pounds, so it’s portable enough to keep in your car. The Firefly costs just under $2,000, which could buy you a lower-end electric wheelchair that isn’t convertible – but the Firefly gives you the ability to choose whether you want to travel under arm power or battery power.